Your father has asked me to write to you again this morning, about the presidency of the Y.W.C.A. He says he feels more and more strongly the longer he thinks of it, that it would be unwise for you to accept that office for next year, and he hopes that you will decline to consider it. I need not say that I agree with him, dear—Margaret has been telling us how much work the office involves in addition to the constant weight of responsibility. Of course you will say that some one must do it,—why not you? The answer is simply that while you are a perfectly healthy girl, your constitution received several severe shocks (notably the one in North Carolina.) at a critical age, and it is peculiarly important that your strength should not be over taxed until you reach full maturity. 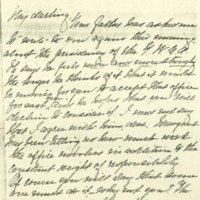 You evidently have an excellent constitution with a greatdeal of vitality—(else you would not have rallied as you did in 1903,) and if you are wise now you will be a splendid, vigorous woman, much more useful in the future to the Y.W.C.A., or whatever else interests you, than if you risked your health for its sake just now. The Senior year is the hardest anyhow, especially towards the spring when the weather is so debilitating in Balt. ; and we are both perfectly sure that the ordinary duties and activities of the year are as much as you ought to undertake. Just tell them, darling, that it is your father's wish that you should decline and they cannot blame you. Wilson, Ellen Axson, “Ellen Axson Wilson to Jessie Woodrow Wilson Sayre,” 1907 February 20, WWP17374, Jessie Wilson Sayre Correspondence, Woodrow Wilson Presidential Library & Museum, Staunton, Virginia.